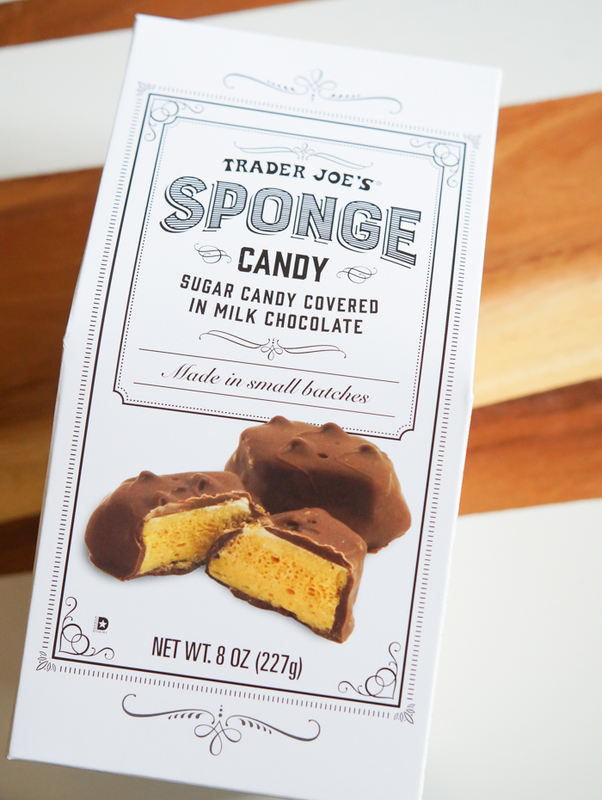 This week we're reviewing Trader Joe's Sponge Candy. We'd never seen it in store before, so of course, that meant we had to immediately buy a package. 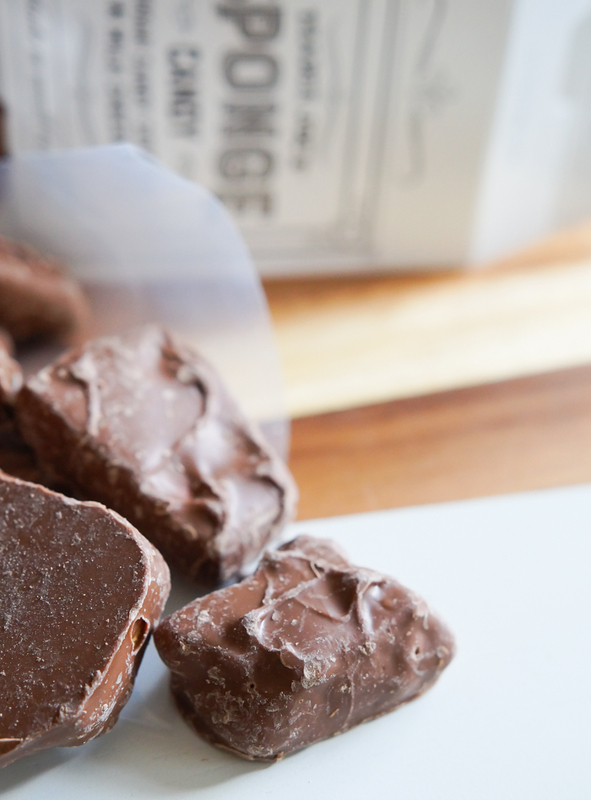 Trader Joe's Sponge Candy comes in an 8-ounce package and costs $3.49. The package says it's "sugar candy covered in milk chocolate" and "made in small batches." A mom's (my) take: This is my first time eating sponge candy. I've seen it on blogs and in cookbooks and it always looks appealing to me. The center of the candy is crunchy, and at the same time, light and airy. Taste-wise, it's similar to toffee, but much lighter in texture. There's a generous coating of milk chocolate all the way around. Adding to its charm is the fact that the pieces vary in size, giving it a candy-shop or homemade feel. "It's the way it shatters that matters"... wow, brings back memories! Is it similar to peanut brittle, without the peanuts? I've heard that called Honeycomb candy before. Looks fabulous, either way. Wish we had a TJ's here (College Station, TX)! I am from Buffalo, NY and sponge candy is BIG there. I now live in CA and most people don't know what it is! I live in Buffalo and I love sponge candy! If you want to try the real deal, order some from a local candy maker. (Parkside Chocolates, Watsons or Park Edge all deliver nationwide) But act fast because you can't get sponge candy in the warmer months, due to the humidity. So glad to see one of my childhood favorites being introduced to others!! 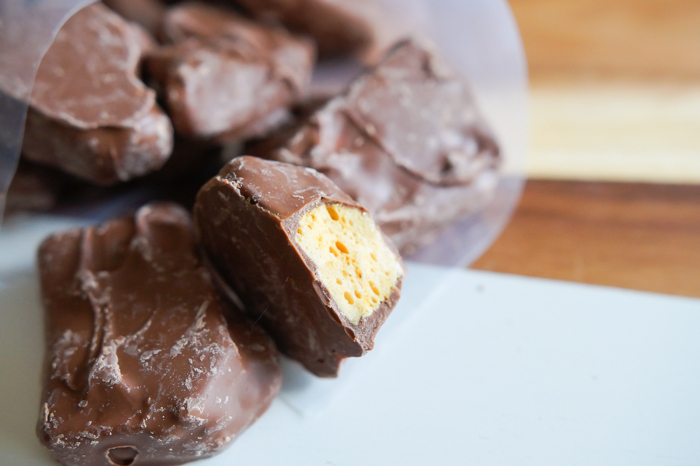 Sponge candy is a Buffalo delicacy! I just purchased it as well and loved it. I used to buy crunchie bars that are similar but cannot find them in the USA anymore. I have never tried making it but have seen the recipes for honeycomb candy. I hope trader joes makes it a staple! I'm from Wisconsin and know it as Fairy Food, too. This is my youth..my mom made it..I think i did too about 40 yrs ago..loved it ..we could buy it w/out choco..in a tight cello..but when I didcovered w/ choco..that was it.. I can't eat it now..but the desire is there! Yes, I've seen it as Honeycomb and it's easy to make, but easier to buy��! Do you have an IG, I would like to follow! I'm from Wisconsin and I"ve never heard of it called fairy food. Angel food candy or sponge candy are what I've heard and it's divine. I hope to try trader joe's brand someday. is it season or do they have it all the time does anyone know? I live more then 2 hours from the closest TJ so only get there once a year or so.